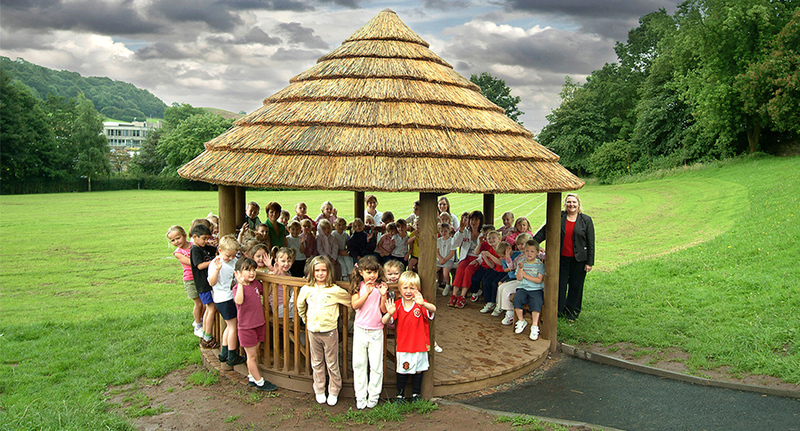 A shelter was required for a primary school which could be positioned just off the main play area. It needed to be interesting, attractive, constructed of natural material and safe for use by the school children. It was essential that the building provided shade for hot, sunny days and shelter in showery weather. Comfortable seating was important, as classes were to be held outdoors in the fresh air for up to 36 children. However it was also essential that the structure was not overly large, as it was also to be utilised by just a few children at a time as a quiet, reflective or reading area during lunch breaks. 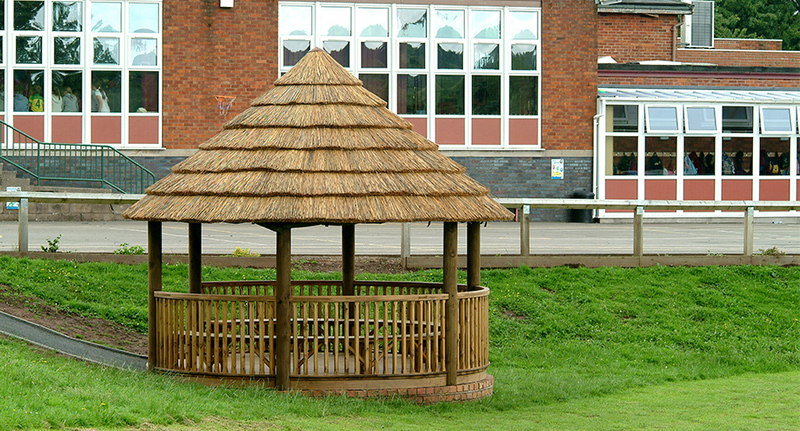 A large circular gazebo was the ideal solution to this brief. Constructed from natural timbers with a natural Cape Reed thatch roof, the building fitted into the rural location perfectly. A timber-lined roof clad with thatch ensured the building was not only dry in rainy weather but also provided cool shade on hot, sunny days. Bench seating which hugged the handrail ensured that at least 36 children could sit comfortably during their lesson. The school are delighted with the results and the children love it, taking their books and reading in there at every opportunity.